There is nothing like a little life getting in the way of plans. A little (actually a lot) family drama and some spring cleaning put me in bed with a rheumatoid flare and a pair of worthless hands. My poor husband and kids were having to fend for themselves for dinner--not a pretty sight. I was also eating comfort food that wasn't helping me get better. I attempted to stay on track with my sewing plans, but didn't do too well. I missed a few Me-Made days while in pajamas or sweats. But worse was that I couldn't type! It isn't very easy to blog without typing. Middle Son was also becoming annoyed at being asked to take my picture everyday. So, I'm back. I'm taking it slow and attempting to pace myself. Pacing is not easy for me. I did managed to get some sewing done. I also have some works in progress, but I want to get to one of my favorites. Our sons' elementary was having its 50th anniversary celebration. This was also Mr.Toad's elementary so I had no choice but to go. Since it was hot, I wanted something comfortable, casual and nice to wear. After my first attempt at McCall's 6559, I kept thinking of how I could make it fit better. I felt like the neck was too wide. I had an idea. Why not take the extra out of the middle of the dress? I had my fabric all washed and waiting patiently to be cut, but I decided to see how it might look. I grabbed my first attempt at McCall's 6559 and pinned the front and the back, taking out about 1/2 inch from the front and the back. Much, much better. I went to work and folded 5/8" from the center of the pattern and cut out the front and the back. 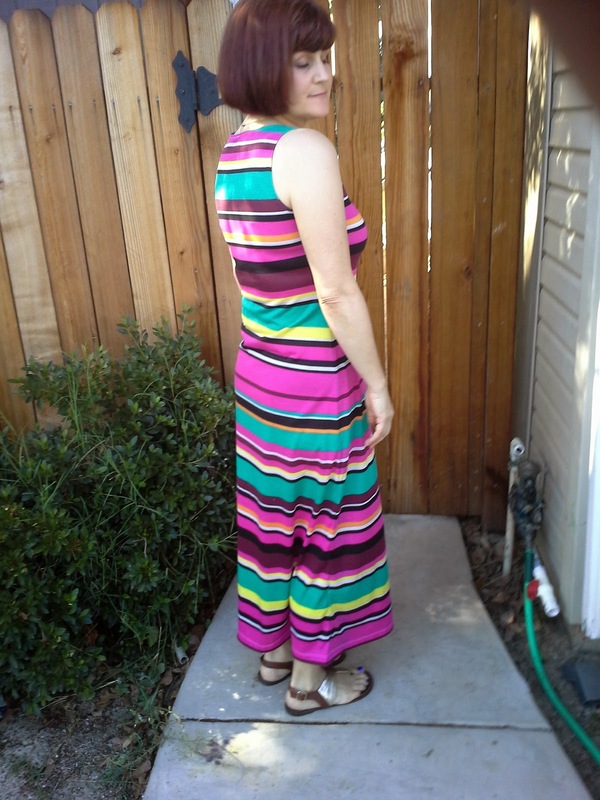 This time, I thought I would try it as a maxi dress. If I didn't like it, I could always shorten it. Like the first time, this was a quick sew. I used the hemming attachment on my coverstich for the hem. To use it, I measured and pressed the hem. Then, I just put the fabric through the attachment and it gave an even, effortless hem. Unfortunately, I had some trouble with doing the the same on the neck and the armholes. Since I was having trouble using the coverstich on the armholes and neckline, I decided to just use my widest rolled hem foot on my sewing machine. This was super quick and super easy. Of course, it took me a long time to use the rolled hem foot. I'm sure that I will eventually be able to use the coverstich as easily in time. Even with picking the wayward coverstich stitches from the neckline and armholes, this awesome $10 maxi dress took less than 45 minutes. That includes changing thread in the serger, cover stitch, sewing machine and clean up. We had a great evening and I had a bunch of compliments. I may need to make another. I already have a grey, teal and purple chevron washed and waiting to go. Sometimes we are harder on ourselves when life slows us down. 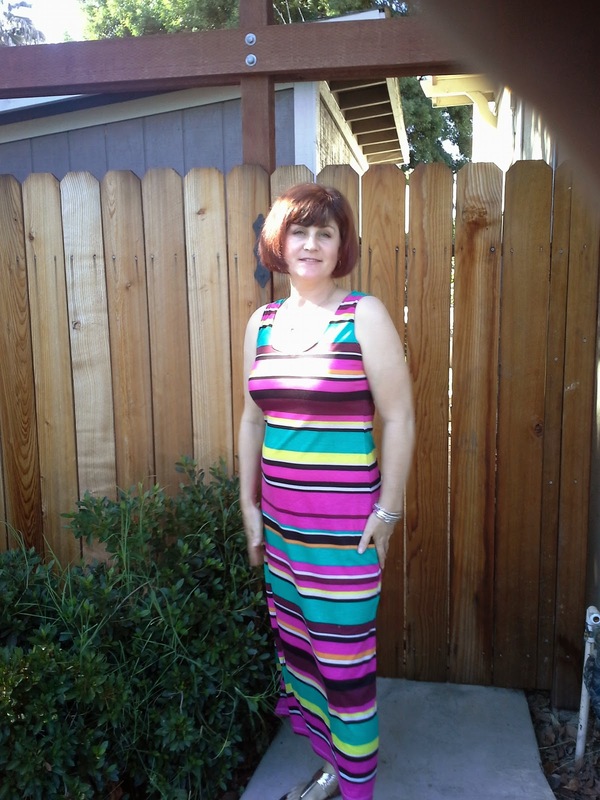 You did a wonderful job on the maxi and it looks great on you. Stylish and comfortable--that's the way to go. Thanks Robin. I am hard on myself. I was wiped out, but literally dreaming of sewing! Hope you are feeling better! Very pretty dress...you will definitely get a lot of wear out of thus during the summer. You are one hot mama! Thanks, Annie. I have worn it four times in the last 8 day! I think I need to take another hour and make the grey, purple and teal chevron. I just wish people would stop thinking I'm dressed up. I'm glad you are on the mend - stress, family drama's and your flare - not a good mix. I do find that when I am stressed, I tend to have a flare at some point. When I was fist diagnosed, it took me a long time to accept and I used to try and push myself. I have learnt this is not the wisest thing - now I pace myself much more and find I actually have more productive time. I still get flares of course, but the underlying fatigue is always there. Very annoying you couldn't use your hands - I have had that once, but mostly I am wrist, ankle, backs and hips, and legs. So I feel for you, but really, do be kind to yourself , as much as you probably are for other people. By the way, your hair looks lovely. Now, the dress - its lovely - and quick sews are a good way to go when you are getting back your mojo :). It suits you beautifully - and don't worry about what other people think - maybe they feel uncomfortable with the idea of you being "smarter"than them - that's their problem, don't make it yours :) And do make the other as well !! You are so sweet Sarah Liz! I think I have had most of my joints cause problems at one time or another. I know it is RA when it is on both sides. I really like my hair. I had been waiting to go in until I had the energy. I finally went in because my hands hurt so bad that I wanted someone else to wash and style it. I like when it is short. So much easier to wash and style. Thanks Tanya. I am so sorry about your strep throat. No fun with that! I have definitely been wearing this dress a lot. It is so easy to wear. Hello, and welcome back, Mrs. Toad! I have missed you, and am glad to see that you are feeling better! I love your maxi dress, and your new haircut! I agree that it would not hurt to make more. It is quick and easy when it comes to getting dressed too, and you do look lovely--without all the extra fuss! Thank you Vanessa. I never thought I would wear a maxi dress. What a surprise to find that I like it! I think the next one will be made soon. The neighbors are probably wondering why I'm wearing the same dress so often. I too had been looking for you! You are so sweet Nakisha! I am going to learn to pace myself. I've been trying for the last seven years. Believe it or not, I'm pacing myself better than I used to. Thanks so much! You do realize you inspired this. I had the poster city knit and wanted to do the right thing and I WASHED it. It is now unacceptable to make in a length that would be appropriate. I have been staring at it trying to find a way to make it into something that would honor its uniqueness. While I am sad that it shrunk. I am very glad that I found that it shrunk before sewing it up. I am thinking a top that would work with the teal denim I bought from Emma One Sock at the same time. I just have a hard time with decisions! I am so glad you're feeling better; I missed you. Your dress is very beautiful. I think I missed being online more than I was missed. I am still having trouble typing, but just tired of doing little.